A few days ago, a man named Rob hung himself. I met Rob only once – the day he gave me my first tattoo. Here’s the background: as a result of my legal status (a subject for another day), I’d never left the U.S. since I first arrived when I was seven years old. I was all set to change that – I was leaving soon to backpack through Europe indefinitely. This felt like a major transition in my life, and I wanted to mark it with my first tattoo. I thought for a long time about what the tattoo should be. 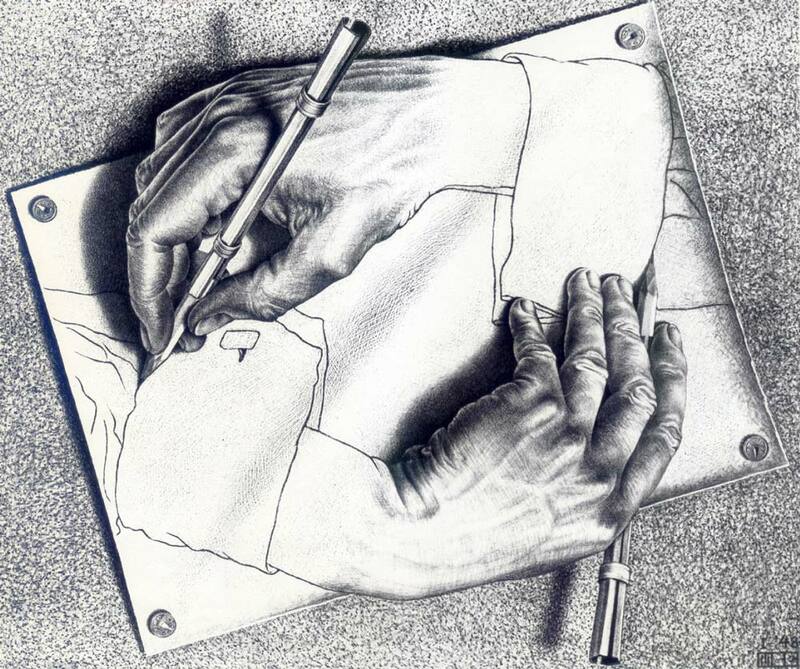 For a while, I’d settled on Escher’s “Drawing Hands.” It represented, for me, the notion that we create ourselves. But, I soon thought: if that’s the idea I want to mark on my body, then I should do it with an image that is actually my own creation. And so I decided on a doodle I once drew on a piece of receipt paper while working at a restaurant – a piece I’d titled “Love.” I have a huge collection of “restaurant doodles” from my server days, and “Love” has always been my favorite. How would you like to spend 2 hrs. this close or closer to Jennifer Lawrence’s face? One: keep the camera max ten inches from Jennifer Lawrence’s face. Capitalize on the fact that the audience is just as confused and upset as Lawrence is. In other words, feed the audience their own experience of watching this movie in the form of the star’s omnipresent performance. Two: take the house-as-planet-Earth metaphor and play it out as literally as possible. Mismatches between what a house is literally like and what life on planet Earth is literally like will arise. Allow these mismatches to develop their own absurd logic and allow that logic to run the film’s dramatic engine. The result is, again, a surprisingly unique movie. I’ve never seen another movie like it – I don’t get to say that often. It’s also interesting enough to get me to write this post, which is more than a movie has compelled me to do in years. Posted in: Personal Filed under: aronofsky, eternal return, film, jennifer lawrence, mother!